If Steve Case has his way, the next generation of workers will know the Upper Midwest not as the Rust Belt, but as the Startup Belt. Today, former AOL cofounder Case kicked off the sixth iteration of his Rise of the Rest tour in the central Pennsylvania cities of Harrisburg, York, and Lancaster. On each of these tours, Case travels to cities across the U.S. that have traditionally been overlooked by investors — from Albuquerque, New Mexico to Charleston, South Carolina — to highlight existing startup activity. This year, Case and his team are traveling to five locations in the Rust Belt. Over the course of the next week, they will travel to Ann Arbor, Michigan; Indianapolis; Columbus, Ohio; and Green Bay, Wisconsin. “I do believe that we’ll start to see a more evenly distributed innovation economy over the next 10 years,” Case said during the kick-off event. It’s no secret that many Rust Belt cities are struggling to diversify their economies as automation threatens to take away millions of manufacturing jobs. A September report from the Economic Innovation Group found that in the Rust Belt states of Michigan, Ohio, Indiana, and Illinois, more than 40 percent of ZIP codes have fewer jobs and businesses than they did in the year 2000. (Pennsylvania fares slightly better, with 34 percent of its ZIP codes having fewer jobs and businesses than in 2000). Harrisburg, Lancaster, and York face the added challenge of having to compete with bigger metropolises in their own states — like Pittsburgh and Philadelphia, for example. 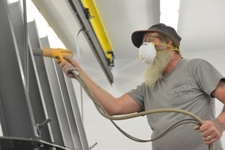 The three cities each have a population of around 50,000-60,000 and are located in the heart of Pennsylvania Amish country, an area that’s been traditionally known as a hub for manufacturing and agriculture. Sam Abadir, the founder of Lancaster-based early-stage VC firm Aspire Ventures, says that one challenge startups often face when recruiting potential employees from outside the central Pennsylvania area is convincing them that there is indeed startup density in the area. There are some institutions — like Aspire Ventures, which focuses on artificial intelligence and internet of things companies — that have made pooling resources an important cornerstone of their business model. Aspire Ventures gives its portfolio companies access to a shared team of staffers, like data scientists, developers, and designers, to help them build their business. But Lisa Riggs, president of the Economic Development Company of Lancaster County, hopes that the Rise of the Rest tour will encourage more large-scale collaboration between Harrisburg, Lancaster, and York. Case was joined at the Rise of the Rest stop in central Pennsylvania by other members of his VC firm, Revolution — including JD Vance, a partner with Revolution and the author of the Rust Belt memoir Hillbilly Elegy. Case and his delegation spent the day visiting with tech startups and other economic development organizations in Harrisburg, Lancaster, and York. The event ended with a pitch competition, where the winner, a York-based startup called Device Events, won a $100,000 investment from Case. Device Events is a subscription-based service that helps medical providers identify problems with medical devices. In addition to collaboration, many of the founders, investors, and economic leaders that participated in the Rise of the Rest event said that the three cities need to do a better job of showcasing tech startups’ work to the rest of the community. 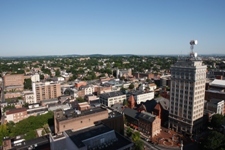 “Some of the bigger players in these communities don’t know what startups can offer them,” Vance told VentureBeat during the stop in Lancaster. Another point of discussion among Rise of the Rest attendees was whether the manufacturing-heavy central Pennsylvania area will be equipped to deal with the workforce changes that technologies like automation and artificial intelligence will bring about. “The thing that scares me the most is not that we don’t have the resources [necessary for tech startups], it’s that things are changing faster than we realize,” John McElligott, a serial entrepreneur from York, told VentureBeat in an interview. McElligott moved to York from Baltimore 14 years ago with his wife at the time. The two were looking to purchase a home and accidentally picked up a brochure for York. After visiting, McElligott decided to make central Pennsylvania his base, attracted by the tight-knight community in York. After dabbling in photography, in 2009 he founded a software startup called Theusic, an online marketplace for artistic services. However, the idea faced skepticism from many residents who, steeped in York’s manufacturing tradition, gravitated toward physical tech. That experience inspired McElligott’s latest ventures — York Exponential, a startup that lets manufacturers lease collaborative robots by the hour, and the non-profit Fortress Initiative, which manages Pennsylvania’s first and only licensed coding and robotics bootcamp. McElligott says that the two organizations aim to solve a problem that’s on the mind of many York residents — how the town will cope with the retirement of older workers and recruit the younger generation to work in manufacturing. Between 2007 and 2016, York County lost 6,600 manufacturing jobs, according to data from the Pennsylvania Department of Labor & Industry.